LONGMAN & CO., AND SIMPKIN, MARSHALL, & CO., LONDON. EDINBURGH : PRINTED BY NEILL & CO.
1. Amativeness, . . . ib. * The figures marked (1) are copied from engraved portraits, &c., in general circulation ; the others, with the exception of those marked (2), are drawn from skulls, or casts from nature, in the collection of the Phrenological Society. These figures of skulls and casts are drawn as nearly as possible on the same scale, the dimensions being reduced to one fifth of those of the real subjects, except in the case of the figures on pages 122 and ] 27 of vol. i. The scale is subjoined. *The measurement in the Tables in vol. i. p. 157, and vol. ii. p. 370, are taken by inserting the point of the leg of a pair of callipers into the hole of the ear, and bringing the point of the other leg to the centre of the situation of the organ on the skull. The distance noted in the tables is the length of a straight line extending from one of these points to the other. In reducing the skulls to a flat surface in the drawings, the measurements could not be made to correspond exactly with those given in the tables, because the lines represented are different. The approximation, however, is as great as possible, and one principle is followed in all the drawings, so that relatively to each other they are correct. 388 to 391, head-title, for cerebral read comparative 423, line 3, after text, insert vol. i. 425, - 3, after text, insert vol. i. 433, - 3, after text, insert vol. i.
Plates I. and II. face vol. i. p. 50. Plates III., IV., V., and VI., face vol. i. p. 140. Let pages 71 to 74 of vol. i. be properly inserted between pages 70 and 75. Vol. 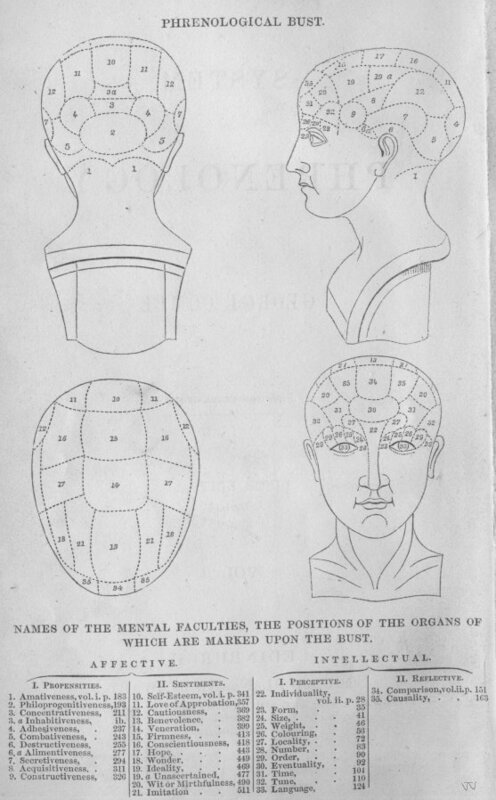 1: [front matter], Intro, Nervous system, Principles of Phrenology, Anatomy of the brain 1.Amativeness 2.Philoprogenitiveness 3.Concentrativeness 4.Adhesiveness 5.Combativeness 6.Destructiveness, Alimentiveness, Love of Life 7.Secretiveness 8.Acquisitiveness 9.Constructiveness 10.Self-Esteem 11.Love of Approbation 12.Cautiousness 13.Benevolence 14.Veneration 15.Firmness 16.Conscientiousness 17.Hope 18.Wonder 19.Ideality 20.Wit or Mirthfulness 21.Imitation.